Veteran Norwegian designer and builder Ulstein will, for the first time, build one of its signature X-Bow hull designs in the U.S., Maritime Reporter has learned. Edison Chouest Offshore’s LaShip shipyard in Louisiana is keen to build, and has found a Norwegian partner to share the risk. Judging by ever-evolving Ulstein business models and Jones Act strictures, Ulstein’s U.S. foray could lead to series production of the SX 165 offshore construction vessel. The U.S.-built combined light well-intervention and inspection, maintenance and repair vessel will be the second of the type. A prototype will be made at Ulstein’s yard in Norway, where close collaboration with is the norm with Island Offshore, Chouest’s joint venture partner on the project. Having Ulstein take on all the detailed engineering was said to have been an attractive element to the deal for the U.S. yard, despite its modernity. Chouest will avoid having to assign “80 or 90 engineers” the task of overseeing the newbuild. “The idea is to build the prototype here in Norway and then to copy that in the United States yard,” said deputy chief executive Tore Ulstein. The first SX 165 will slide the slip in Louisiana “by Christmas 2015” despite changes to the beam and length decided late in development. The Island Performer — an SX121 of similar layout to the SX165 and delivered by Ulstein this July — incurred last-minute design changes that included a beam widened by 2 m to 30 m on a 150 m long vessel. Decisions to make changes were “made in stages” after steel had been laid. 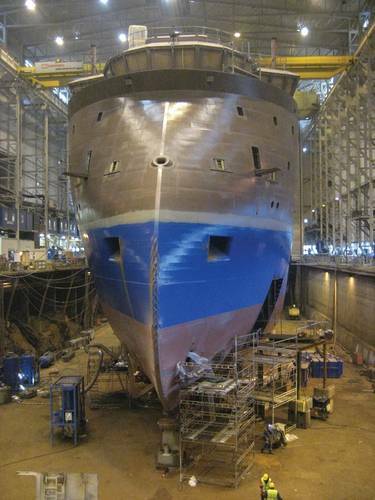 “It’s a milestone for us,” said Ulstein, of Chouest building an Ulstein vessel in the United States for the first time. Older generation UT designs now owned by Rolls-Royce had once been American-built. The X-Bows date to just 2006, when Bourbon Offshore took delivery of the Bourbon Orca, an anchor-handling tug-supply vessel. Meeting Jones Act strictures “for at least one vessel” appears to have been important to the Island Offshore and ECO JV that’ll operate the two vessels. Island is acting as coordinator on the project. 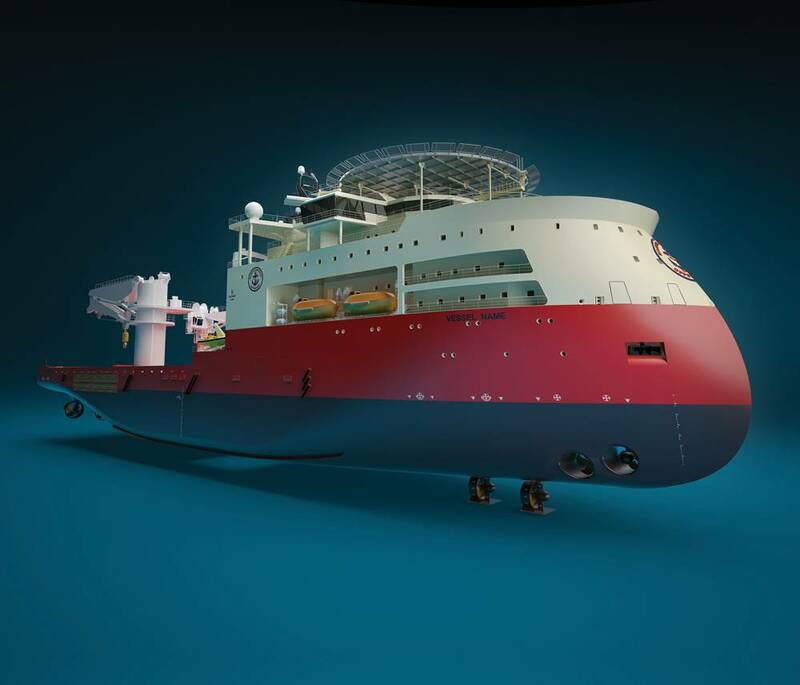 Mr. Ulstein, deputy to his equally energetic CEO sister, Gunvor Ulstein, said the vessel LA Ship will build will be able to lift and lower the increasingly large loads demanded by subsea construction operations. Norwegian oil company Statoil has made much ado about its coming “subsea factory.” and so larger surface-to-seabed loads are anticipated. The attractiveness of the design — a 750 ton handling tower; 400t main and 140t secondary cranes; two moonpools — to the vibrant-again Gulf of Mexico suggests ECO might want to build more of the type into its backlog. It is understood that production of the SX165 will shift from Norway to the U.S. once the prototype is built, although it could be well into 2016 or 2017 before the first X-Bow built in America is launched. Despite the promise of a growing deepwater market for subsea operations, Mr. Ulstein tempers his enthusiasm for the vessels of this well-work class. “I didn’t see this as a mass market. There’s room for some, but it’s not like the PSV market which will (grow) to a higher number (than today),” he says. He confirms, however, that the future market for these OCV types is in the Gulf of Mexico. In August 2014, when Ulstein unveiled the X-Stern — a design for better station-keeping and working conditions in bigger waves — it was clear designers had spent a lot of time speaking to ships captains and ship owners. Yet, “taking a walk with ship owners” is, Mr. Ulstein says, just one of two ways he develops a “business model” which grew out of building sturdy fishing vessels that rivaled the Gulf of Mexico’s early offshore designs. The other model is the “design conduit,” where raw creativity leads to business development. It isn’t clear which development path the SX165 too, but the X-Stern could well have been creativity driving business. Then again, pointing the “stern toward the weather (and the platform)” is “natural for captains”, so a design — if not a market — was created in support of vessel commanders. The Ulstein relationship with offshore vessel owners like Island, with its growing fleet of offshore service vessels, has allowed Ulstein as yard and designer to risk playing ship owner or at least as co-investor for periods, spreading risk with partners in order to build ships. “Ulstein without the (local) maritime cluster would be nothing,” said Mr. Ulstein. Sometimes the cluster isn’t enough. When the company took on 1.6 billion kroner in risk to series-produce the streamlined PX121 platform supply vessels in 2011, it looked outside its local maritime cluster to the financiers at Pareto. Pareto found Nordic American Tankers, which had an office in Sandefjord Norway, wanted in on the offshore market and was building Nordic American Offshore. The PX121 was a yard- and owner friendly design — “the lowest threshold entry into shipping” — and the Ulsteins knew it. Yards “good with steel but who struggle with installations, pipe and electronics” could build it with basic support from Ulstein. Indeed, building 30 PX121’s since 2012 and selling them has given birth to a new Ulstein offering — pre-commissioning services, a business understood to replicate fitting in Norway for overseas yards, including Chinese yards, where 90 Ulstein staff and newly recruited Chinese cooperate at some five yards. The SX165 X-Bow project in Louisiana is the high-water mark for yard and designer Ulstein’s cooperation with other builders. “We’re more than just an ordinary shipyard. We’re investing in vessels,” said Mr. Ulstein. Indeed, he and his sister now preside over 40 new-build projects worldwide, including five at their own yard in Norway, where “we made it possible to be competitive” despite contract costs “20 percent less” in China. Wherever Ulstein ships are built, 90 percent of their content is “Norwegian maritime cluster” and “10 percent content from outside Norway”. “I think the center of gravity is (still) in this region,” said Mr. Ulstein of this patch of western Norway.